You are currently viewing the desktop version of this web page. Click here to see this product and options on a page designed for the smaller screen. This mat set consists of 3 pieces. 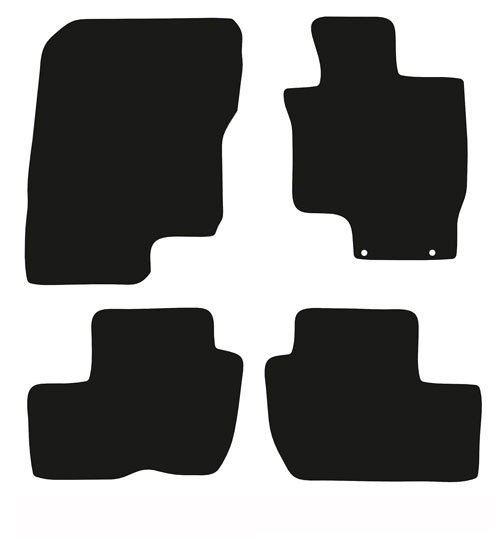 The edge trim will surround all mats AND the driver's heel pad on carpet mats. PLEASE BE AWARE THAT DUE TO COPYRIGHT REASONS, WE ARE NOT ABLE TO EMBROIDER TRADEMARKED WORDS (SUCH AS VEHICLE MANUFACTURER AND MODEL NAMES) ON YOUR MATS. Please note: There are additional charges for embroidery. If the embroidery does not fit along the outside edge (sill) of the front mats, it will be placed across the mats facing the seats. FULLY fitted Car Mats are designed specifically for your Mitsubishi Outlander, to fit the shape of your foot wells. All carpets come with a double layer heel pad on the driver side to protect them from wear most include and a locking mechanism to prevent movement (depending on the model of vehicle). All carpet mats have a slip-resistant backing material. We can trim carpets in any of the available colours and this includes the heel pad on the driver's mat. We offer a wide choice of colours and even a selection of leatherette trims. Most of our carpet floor mats include a standard heel pad at no additional charge. This is usually an additional layer of carpet in the same colour as your floor mat, with the same edge trim. It's positioned to protect your driver's mat from the additional wear of the foot movement in the footwell whilst driving. The thicker carpets cannot have a carpet heelpad, as the materials are too thick to stitch the additonal layer. You can choose to have a rubber heelpad on this however. If you have the carpet heelpad selected when you change the material you will be alerted to any change. We recognise that some people prefer a simpler look of a plain mat, so you can choose to have NO heelpad and the cost is the same. We also offer a Rubber heel pad on all carpet qualities. This offers superior protection for your mat. This is a cost option as displayed above. We offer custom embroidered words on carpet mats along the door-edge of the front pair, so on the right-hand side of the driver's mat and left-hand side of the passenger's. If the embroidery lettering you enter does not fit along the outside edge (sill) of the front mats, it will be placed across the mats facing the seats. For an additional charge we can also add the same writing across the centre of the rear mats. This allows you to have a unique personalised interior for your vehicle. The embroidery is machine-stitched onto a colour-matched backing that is then bonded securely onto the mat. Mitsubishi Outlander PHEV (2014 - 2017) Fitted Car Floor Mats scores 4.7 out of 5 based on 3 ratings.